Great work on art of the model. Especially since he could not breathe in this particular mask. Facial expressions are just as important as posing (if not more). Eiko nails this shot full of attitude. The chiar in this shot is an authentic vintage school chair. The vintage furniture store across the street was kind enough to loan it to me. I think it makes this dominant pose even more spicy. Sometimes there are very different shots happening in the last 5 minutes of shooting. When you know that your best shots are already wrapped up and you just experiment. I always had this pose in my mind and was happy to finally shoot it with this lovely couple. Don't we all adore a nice set of cheeks?! Loved tossing the gas mask into the shoot. Always lots of fun things happening. 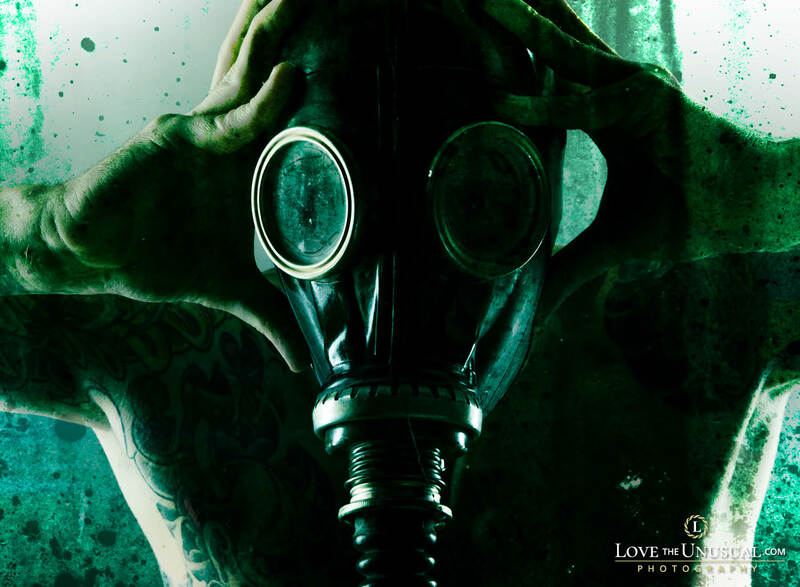 We have several gas mask models at Love the Unusual.